In February 2015, Robbins, with its operating company Robbins India, was asked by Bangalore Metro Rail Corporation Limited to take over the operation and maintenance of two competitor-owned EPBMs. The machines were stalled due to low performance and financial issues from the Operating Contractor and lack of support by the original machine supplier. As the North-South Bangalore Phase 1 Metro tunnels were on the critical path, the BMRC looked to Robbins to step in and take over the troubled project. A Robbins/Robbins India team of 70 field service personnel refurbished and modified the existing equipment, both while in the tunnel and before relaunching the machines in Chikpet station. 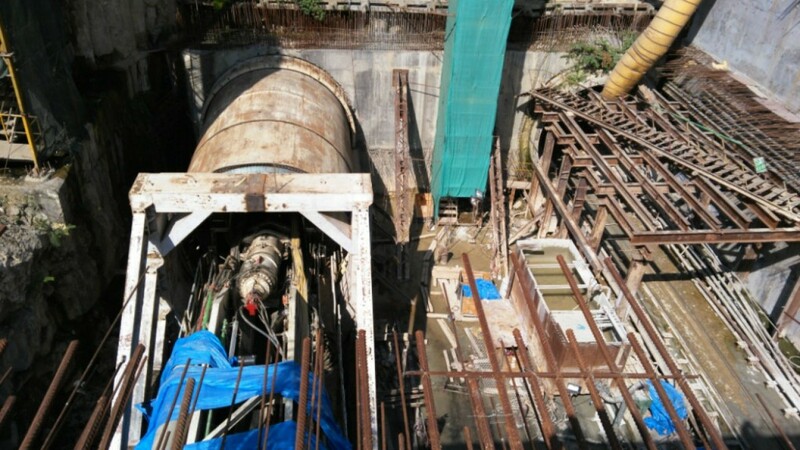 In addition, the on-site Robbins/Robbins India Team supervised all aspects of TBM excavation, segmental lining, mucking and grout plant operations since the relaunch of the machines for both drives. Robbins and crews celebrate Kaveri’s breakthrough on June 8 at Majestic after a 750 m (2,640 ft.) drive. One of two 6.4 m (21.0 ft) diameter mixed-face EPB used to excavate from Chickpet to Majestic. Lok Home, Robbins CEO, joins the Robbins India team in celebrating Kaveri’s breakthrough at Majestic on June 8, 2016. (Left to Right) Lok Home, Robbins CEO, with BMRC Chief Engineer S.S. Hegaraddi. Robbins India Projects Manager Jim Clark, and Robbins India Managing Director Kapil Bhati.